login to your tenant appliance. 2019-03-22 12:39:32,340 DEBUG [com.desktone.view.broker.util.ViewClientSAXHandler]-[https-openssl-apr-4443-exec-9] character data: Abc123!! 2019-03-22 12:39:32,340 DEBUG [com.desktone.view.broker.util.ViewClientSAXHandler]-[https-openssl-apr-4443-exec-9] character data: D3sktop! org.apache.directory.server.kerberos.changepwd.exceptions.ChangePasswordException: Request failed due to a hard error in processing the request. 2019-03-22 12:39:32,483 WARN [com.desktone.view.broker.ViewClientServlet]-[https-openssl-apr-4443-exec-9] Please input valid username and password. Somehow it does not tell you the real issue… After contacting VMware Support, they asked me to check the users in AD (afterwards this was to easy :-)). 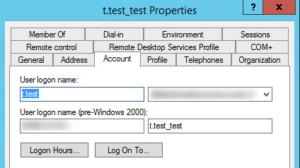 I saw that the users where not equal, the Pre-windows 2000 was like “t.test_test” and the UPN was like t.test. So I made them both t.test_test, and tried to reset the password again. 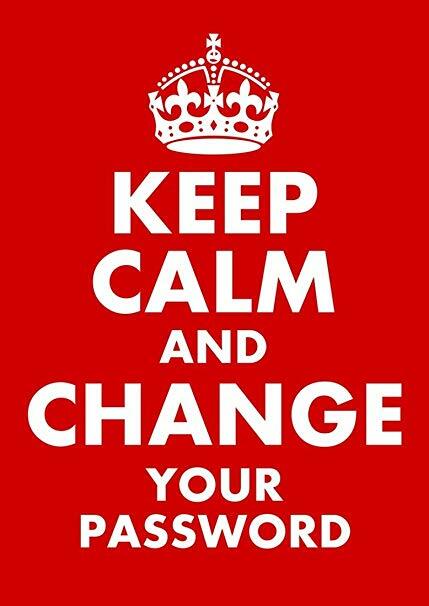 Now I was able to change the password like it should be. 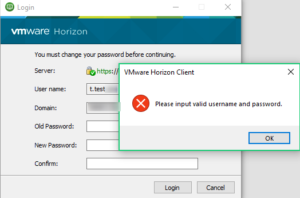 Previous Article VMware vExpert 2019!